Dr. Alcibiades Batista the provincial health director reported that In David, cases of vomiting and diarrhea due to rotavirus are increasing due to lack of water, which limits the population ’s personal cleanliness measures.
" 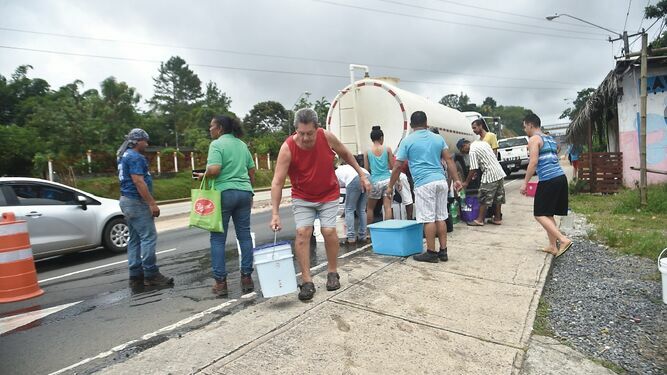 The cases of gastroenteritis in the district of David are viral, as cases have been reported in hospitals, health centers and private clinics, which is worrying” said Batista. He noted that due to the sectorization program (delivery of water in tankers) by the Institute of Aqueducts and Sewerage s (IDAAN) and the placement of valves at different points is generating the problem. at this time. of antibacterial gel to clean their hands constantly. Currently the plant potabilizer is generating 12 million gallons a day to supply 140,000 inhabitants. which is not enough. In the rainy season, it delivers 40 million gallons. And they still encourage the water trucks to spray water over the crowds at Carnival. And they still encourage the huge trucks to spray water all over during Carnival. Talk about waste. Claire is correct and to the wasteful toilets and faucets, we could add all the leaky pipes with no glue in the connections before the water ever gets to it's destination, wasteful industrial and construction practices, unnecessary use of water for washing cars and sidewalks, or using running water to replace the effort of washing clothes. Panama doesn't have nearly as much of a drought problem as it has a water waste problem. There is insufficient respect for the fact that water is not an unlimited commodity. It must always be conserved, kept clean, and used as though our lives depend on it. A big problem is that many businesses (and homes) have toilets that never quit running water, and faucets that don't shut off properly. That negligence wastes thousands of gallons of water.